Welcome to this website describing my Tonkinese cats and kittens. I love the breed and want to show what great pets they can be. I don’t currently have any breeding queens, but I have two female kittens who will take over that role, and four other pet cats. I sometimes have kittens available for loving homes, but I’m not planning another litter until Autumn 2015. Tonkinese cats are lively and intelligent and very friendly, making them ideal pets. I am a registered breeder with the Governing Council of the Cat Fancy (GCCF), the main governing body that oversees the breeding and showing of cats in the United Kingdom. I am also a member of the Tonkinese Cat Club and the Tonkinese Breed Club, the two societies in the UK dedicated to the Tonkinese breed. 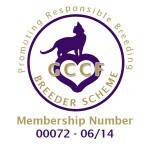 I follow the Tonkinese Breeding Policy set out by these organisations. I live in Ibstock near Leicester in the East Midlands of the UK, with my husband Andy. Please feel free to contact me if you have any comments or questions. Site last updated on 20th November 2014.